View a slide show of garden photos. 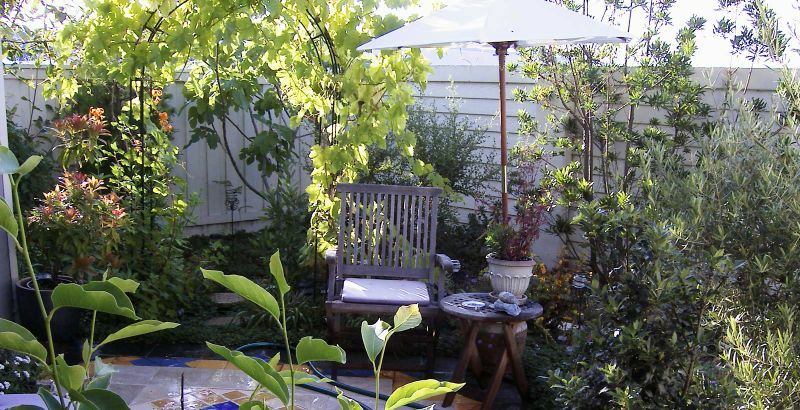 Beginning in 1999, I have planted dozens of California native plant species in my small, 620-square-feet backyard/patio. The goal is to create a garden that supports plant and animal life adapted to local conditions (this means dry and cool summers, mild and wet winters), with minimal human interference. The inspiration came naturally, from years of hiking in the glorious California outdoors. In order to simulate natural conditions for my backyard eco-system, I only use organic fertilizers and no pesticides. Gardening with native plants saves water resources, attracts native wildlife, is very good for the environment. Everyone should try it. Half of my native plant specimens came from nurseries, the rest came from field collection. Yerba Buena nursery is the main specialty nursery for native plants in the Bay Area. The East Bay chapter of California Native Plants Society conducts native plant sales twice a year, usualy in April and October. I have acquired some native plants from local nurseries, notably the East Bay Nursery, Berkeley Horticultural Nursery, and Westbrae Nursery in Berkeley. The only mail-order nursery I have shopped from is the Forestfarm in Williams, Oregon. 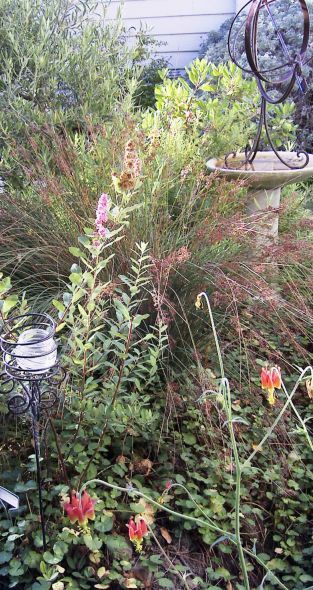 When selecting plants, I primarily focus on scale (for a small garden), foliage and twig form (to provide interest when not blooming), and blooming season (to balance spring blooming plants with those blooming in other seasons). California Wax Myrtle Myrica californica (Mendocino County): elegant form, very easy to establish; already 12' high in 5 years. Sticky Monkeyflower Mimulus aurantiacus (Contra Costa County): heavy bloomer for 3-4 months in summer, very easy to establish, needs leaf pruning and dead-heading in fall. Silver Bush Lupine Lupinus albifrons (Alameda County): heavy bloomer in early spring, beautiful silvery foliage, very easy to establish. Toyon (Christmasberry) Heteromeles arbutifolia (Contra Costa County): elegant form, tropical-looking foliage, moderately easy to establish; flowering after 5 years. Black Sage Salvia mellifera (Alameda County): very fragrant, vigorous, very easy to establish. Bush Anemone Carpenteria californica: large showy blooms in spring, easy to establish. Blue Blossom Ceanothus Ceanothus thrysiflorus: easy to establish, fragrant blooms in winter and spring. Manzanita Arctostaphylos: elegant form, beautiful burgundy bark color, slow growing. California Sagebrush Artemisia californica (Marin County): strong fragrance, easy to establish, requires plenty of sunlight. Virgin's Bower Clematis ligusticifolia: vigorous, easy to establish; white blooms in summer; deciduous, needs heavy pruning in fall. Wild Grape Vitis californica: deciduous, wine red fall color. Woodland Strawberry Fragaria vesca (San Mateo County): lush ground cover, white flowers in spring, fragrant edible fruit. Beach Strawberry Fragaria chiloensis (San Mateo County): larger white flowers in late spring, evergreen ground cover. California Poppy Eschscholzia californica: showy golden flowers in spring. California Fuchsia Epilobium canum: exquisite red flowers in late summer. Blue bedder Penstemon Penstemon heterophyllus: tubular flowers in summer. Blue-eyed Grass Sisyrinchum angustifolium: exquisite bluish-purple flowers with yellow centers in early summer. Rosey Buckwheat Eriogonum grande: heavy clusters of pink flower heads in summer. Beach Sage Artemisia pycnocephala: unique furry silvery foliage. Blue Rush Juncus patens (Contra Costa County): strong linear texture, evergreen, extremely easy to establish. Island Buckwheat Eriogonum arborescens: succulent-like, slow growing. Cascara Buckthorn Rhamnus purshiana (San Mateo County): deciduous, moderately easy to establish; birds love the berries; already 14' tall in 5 years. Pacific Madrone Arbutus menziesii: the most elegant native tree; very particular. Incense Cedar Calocedrus decurrens (Marin County): evergreen, beautiful foliage, easy to establish, already 9' tall in 4 years. Salmonberry Rubus spectabilis (Mendocino County): very easy to establish from cutting; now 9' tall; evergreen, hot pink flowers in spring, needs leaf pruning in winter. Coffeeberry Rhamnus californica (San Mateo County): evergreen, beautiful foliage. California Bay Umbellularia californica (Contra Costa County): elegant foliage; slow growing. Tan Oak Lithocarpus densiflorus (Marin County): slow growing. Coyote Mint Monardella villosa: sweet fragrance, dainty form, evergreen, purple flower heads in summer. Redwood Penstemon Keckiela corymbosa: evergreen, deep red flower clusters in summer; dried leaves turn reddish. Douglas Spiraea Spiraea Douglasii: deciduous, fuzzy pink flower clusters in summer. Evergreen Huckleberry Vaccinium ovatum: elegant form, reddish new foliage in spring. California Honeysuckle Lonicera hispidula (San Mateo County): Easy to establish, evergreen, dainty pink flower clusters in summer. Giant Chain Fern Woodwardia fimbriata (Marin County): strong tropical-like form, evergreen, easy to establish. Bracken Fern Pteridium aquilinum (Alameda County): beautiful foliage patterns, deciduous, invasive. Lady Fern Athyrium felix-femina (Alameda County): dainty foliage, deciduous, less tolerant of sun, wind, and drought. Coffee Fern Pellaea andromedaefolia (Contra Costa County): gorgeous foliage, ground-hugging form, evergreen; more drought tolerant than most ferns. Coastal wood Fern Dryopteris arguta (Alameda County): deciduous. Deer Fern Blechnum spicant: beautiful form, needs plenty of shade. Checker Bloom Sidalcia malviflora (Marin County): vigorous ground cover, pretty evergreen foliage, delicate pink flowers in summer. Redwood Sorrel Oxalis oregana: pretty textured ground cover, evergreen, requires deep shade. Stream Orchid Epipactis gigantea: tropical-like foliage, cute yellowish-green flowers; susceptible to aphids. Douglas Iris Iris douglasiana (San Mateo County): evergreen, delicate purple flowers in spring; fast multiplying. 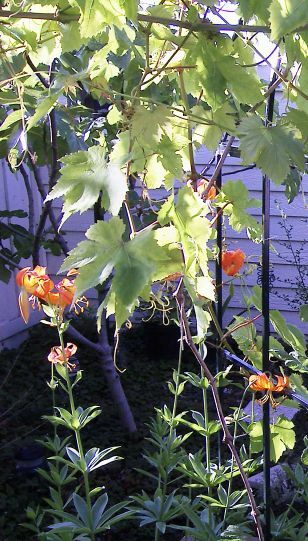 Tiger Lily Lilium pardalinum: dies back from fall to spring, quick tall growth in mid-summer, amazing orange flowers. Pink Flowering Currant Ribes sanguineum: exquisite flower clusters in early spring. Western Bleeding Heart Dicentra formosa: elegant clusters of heart-shaped flowers bloom for months in spring. Summer Columbine Aquilegia eximia: elegant red flowers in mid-summer. Elegant Brodiaea Brodiaea elegans: elegant purple flowers in early spring, dies back from summer to winter. Western Spring Beauty Claytonia lanceolata: evergreen, lush glossy foliage, dainty white blooms stay for months in summer. Rock Lettuce Dudleya farinosa (Sonoma County): succulent, beautiful rosettes, evergreen. Stonecrop Sedum spathulifolium (San Mateo County): succulent, evergreen, requires moderate sun to bloom. Soap Lily Chlorogalum pomeridianum: dainty white lilies only open at dusk; very short bloom time in mid-summer. Fremont's camas Zigadenus fremontii (Contra Costa County): elegant flower clusters in early spring. Pacific Rhododendron Rhododendron macrophyllum: elegant plant; very particular. Chinquapin Chrysolepis chrysophylla (San Mateo County): beautiful golden foliage.